Tennessee Williams once said “America has only three cities: New York, San Francisco, and New Orleans. Everywhere else is Cleveland.” Having now been to all four places I can understand the sentiment. As I write this, the Construction CPM 2013 conference is in full swing and is proving as dynamic as its host city of New Orleans. A strong line-up of speakers focusing on the tools, techniques, art and science of critical path management is supported by an equally diverse and interesting social program. It’s not all hard work! The networking and social program are always a highlight of Construction CPM and when you overlay the excitement of the French Quarter of New Orleans and you start to really challenge the stamina. The final event last night was a ‘Bourbon on Bourbon Street’ tonight its jazz in ‘Fred’s Nightclub’, both finishing at midnight! If you are involved in project controls start planning for 2014! If the USA is too far to travel, we have a local Governance and Controls Symposium coming up in Canberra in the 10th April. Numerous studies have consistently shown that organisations that support overt corporate social responsibility (CSR) activities, either by allowing staff to participate in voluntary work or by donating to charities, or 100s of similar options for giving back to the wider community do better than organisations that do not. It is an established fact that organisations that embrace CSR have a better bottom line and more sustained growth, however, what has not been clear from the various studies is why! Because the organisation is doing well for other reasons it has the capacity to donate some of the surplus it is generating to the wider community whereas organisations that are not doing so well need to conserve all of their resources. Factor in the effect of taxation and great PR is generated at a relatively low net cost. Because the organisation does ‘CSR’ it enhances its reputation and as a consequence becomes a more desirable place to work and therefore attracts better staff at lower costs and is also seen as a better organisation to ‘do business with’ and therefore attracts better long term partners and customers again at a lower cost than other forms of ‘public relations’ and advertising. Both of these factors have a degree of truth about them and frankly, if an organisation does not seek to maximise any competitive advantage its management are failing in their duties. However, this post is going to suggest these are welcome collateral benefits and the reason CSR is associated with high performance organisations lays much deeper. Governance is about direction, structure, process and control, it also is about the behaviour of the people who own and represent the organisation and the relationship that the organisation has with society. Key elements of good corporate governance therefore include honesty and integrity, transparency and openness, responsibility and accountability. Consequently, a well governed organisation will generally have a good reputation in the wider community; this is the result of the organisation’s stakeholders giving that organisation credibility and loyalty, trusting that the organisation makes decisions with the good of all stakeholders in mind. It can be summarised as the existence of a: a general attitude towards the organisation reflecting people’s opinions as to whether it is substantially ‘good’ or ‘bad’. And this attitude is connected to and impacts on the behaviour of stakeholders towards the organisation which affects the cost of doing business and ultimately the organisation’s financial performance. Therefore, if one accepts the concept that the primary purpose of an organisation of any type is to create sustainable value for its stakeholders and that a favourable reputation is a key contributor to the organisation’s ability to create sustainable value. The importance of having a ‘favourable reputation’ becomes apparent, the reputation affects stakeholder perceptions which influence the way they interact with the business – and a favourable reputation reduces the cost of ‘doing business’. However, whilst a well governed organisation needs, and should seek to nurture this favourable reputation, it is not possible to generate a reputation directly. The organisation’s reputation is created and exists solely within the minds of its stakeholders. As the diagram below suggests, what is needed and how it is created work in opposite directions! What the organisation needs is a ‘favourable reputation’ because this influences stakeholder perceptions which in turn improve the stakeholder’s interaction with the organisation, particularly as customers or suppliers which has a demonstrated benefit on the cost of doing business. But an organisation cannot arbitrarily decide what its reputation will be. An organisation’s ‘real reputation’ is not a function of advertising, it is a function of the opinions held by thousands, if not millions of individual stakeholders fed by all of the diverse interactions, communications, social media comments and other exchanges stakeholders have with other stakeholders. Through this process of communication and reflection the perception of a reputation is developed and stored in each individual’s mind. No two perceptions are likely to be exactly the same, but a valuable ‘weight of opinion’ will emerge for any organisation over time. The relevant group of stakeholders important to the business will determine for themselves if the organisation is substantially ‘good’ or ‘bad’. And because the sheer number of stakeholder-to-stakeholder interactions once an opinion is generally ‘held’, it is very difficult to change. The art of governance is firstly to determine the reputation the organisation is seeking to establish, and then to create the framework within which management decisions and actions will facilitate the organisation’s interaction with its wider stakeholder community, consistent with the organisations communicated objectives. The organisation places short term profits ahead of people. The organisations communications are not to be trusted. The way a valuable reputation is created is through the various actions of the organisation and the way the organisation engages with its wider stakeholder community. 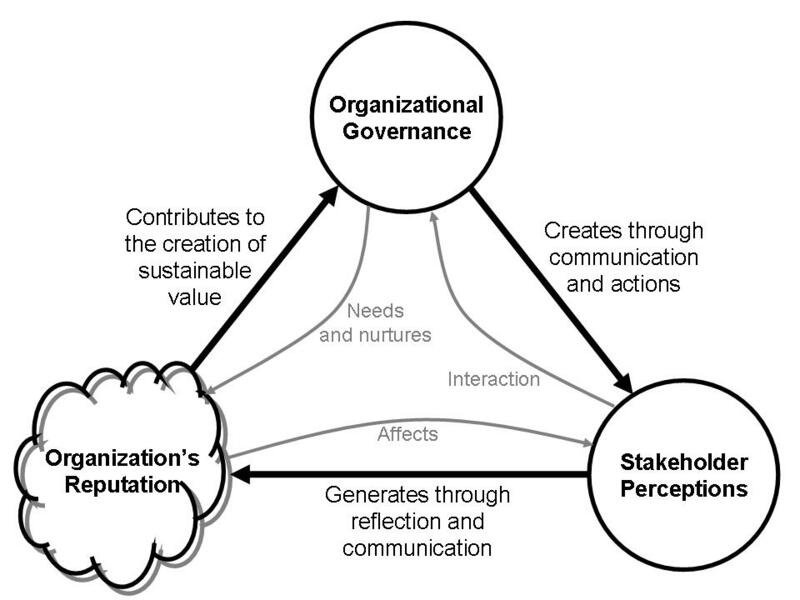 Experiencing these interactions create perceptions in the minds of the affected stakeholders about the organisation. These perceptions are reinforced by stakeholder-to-stakeholder communication (consistency helps), and the aggregate ‘weight’ of these perceptions generates the reputation. The role of CSR within this overall framework is probably less important that the surveys suggest. Most telecommunication companies spend significant amounts on CSR but also have highly complex contracts that frequently end up costing their users substantial sums. Most people if they feel ‘ripped off’ are going to weight their personal pain well ahead of any positives from an observed CSR contribution and tell their friends about their ‘bad’ perception. However, as already demonstrated, actions really do speak louder than words – most of an organisation’s reputation will be based on the actual experiences of a wide range of stakeholders and what they tell other stakeholders about their experiences and interactions. Starting at Board level with governance policies that focus on all of the key stakeholder constituencies including suppliers, customers, employees and the wider community is a start. Then backing up the policy with effective employment, surveillance and assurance systems to ensure the organisation generally ‘does good’ and treats all of its stakeholders well and you are well on the way. Then from within this base, CSR will tend to emerge naturally and if managed properly becomes the ‘icing on the cake’. In short, genuine and sustained CSR is a symptom of good governance and a caring organisation that is simply ‘good to do business with’. Unfortunately, the current focus on CSR will undoubtedly tempt organisations to treat CSR as just another form of advertising expenditure and if enough money is invested it may have a short term effect on the organisation’s reputation – but if it’s not genuine it won’t last. One resource to help organisations start on the road to a sustainable culture of CSR is ISO 26000: 2010 – Social responsibility. The Standard helps clarify what social responsibility is, helps businesses and organisations translate principles into effective actions and shares best practices relating to social responsibility. This is achieved by providing guidance on how businesses and organisations can operate in a socially responsible way which is defined as acting in an ethical and transparent way that contributes to the health and welfare of society. 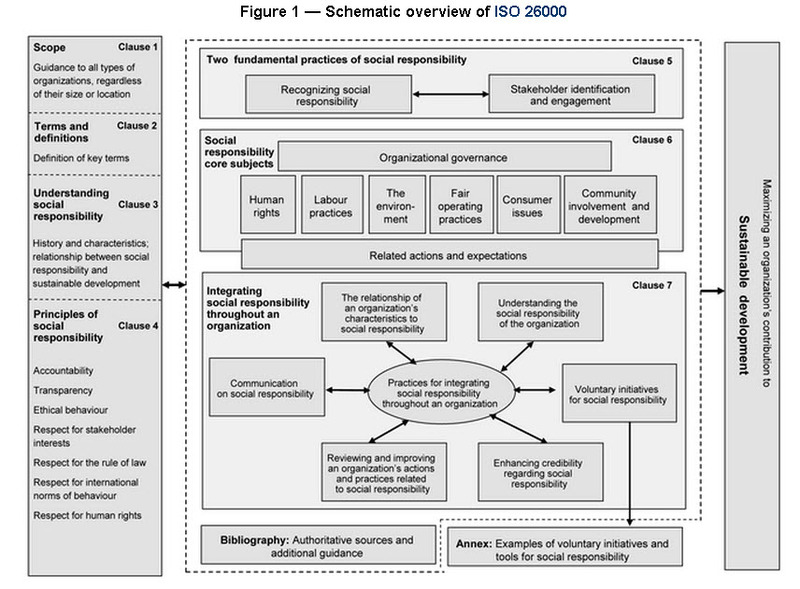 Figure 1 provides an overview of ISO 26000. This has grown into a rather long post! But the message is simple: Effective CSR is a welcome symptom of an organisation that understands, and cares about its stakeholders and this type of organisation tends to be more successful than those that don’t! Looking to earn PDUs / CPD in a great learning environment? One of Europe’s leading international conference and the good news – readers of this blog can claim a 10% discount by enter the code PZ2012_MEDIA02E0AC81 into the discount code field. I cannot make this year but we are planning on being there in 2014. A specialised and highly focused Governance and Controls Symposium to be held in Canberra on 10th April – http://wired.ivvy.com/event/GCSM13/. The call for papers still open and if you are serious about the contribution of project controls to value creation this is a must be at event. The solution to this question is simple but complex…. 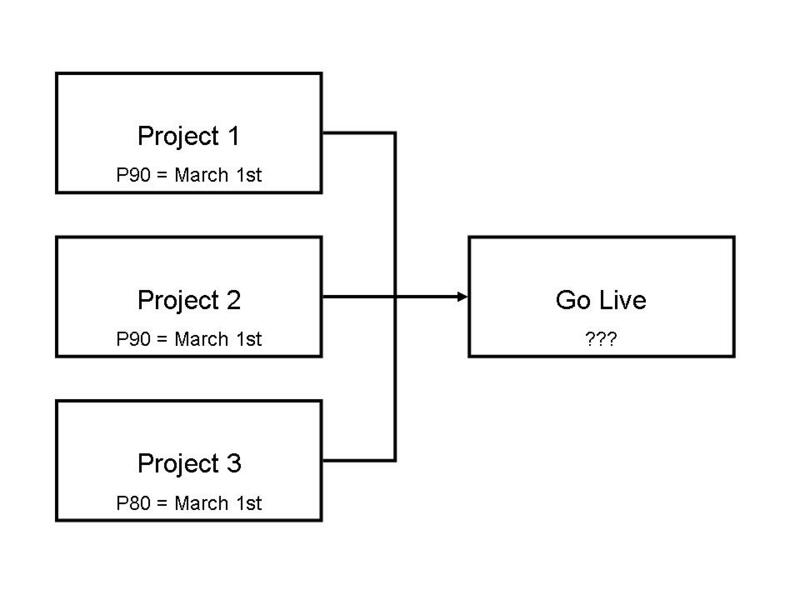 What is the probability of going live on March 1st? If role the dice and get a 1 the project is delayed, any other number it is on time or early. If you role 1 dice, the probability is 1 in 6 it will land on 1 = 0.1666 or 16.66% therefore there is a 100 – 16.66 = 83.34% probability of success. The way this is calculated (in preference to using the graphic) is to take the number of ways a single die will NOT show a 1 when rolled (five) and multiply this by the number of ways the second die will NOT show a 1 when rolled. (Also five.) 5 x 5 = 25. Subtract this from the total number of ways two dice can appear (36) and we have our answer…eleven. Therefore the probability of rolling a 1 and being late are 11/36 = 0.3055 or 30.55%, therefore the probability of success is 100 – 30.55 = 69.45% probability of being on time. 100 – 42.13 = 57.87% probability of success. There are 10 x 10 x 5 = 500 possible outcomes and within this 9 x 9 x 4 = 324 ways of not being late. 500 – 324 leaves 176 ways of being late. 176/500 = 0.352 or a 35.2% probability of not making the ‘Go Live’ date. These calculations have been added to our White Paper on Probability. A Technical question for the risk experts?? 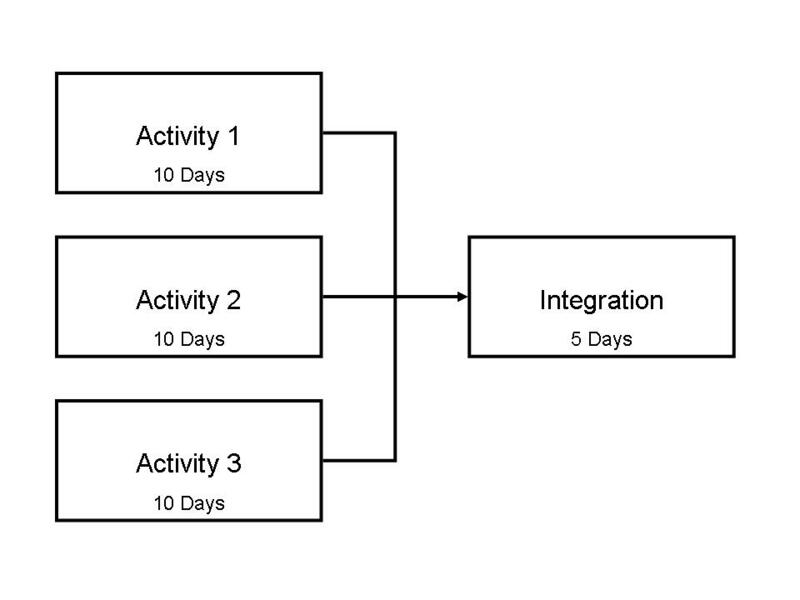 Three schedule activities of 10 days duration each need to be complete before their outputs can be integrated. The three activities are in parallel with no cross dependencies, what is the probability of the integration activity starting on schedule? There is a 10% probability of the start being delayed by Activity 1 overrunning. There is a 10% probability of the start being delayed by Activity 2 overrunning. There is a 20% probability of the start being delayed by Activity 3 overrunning. Therefore in aggregate there is a 40% probability of the start being delayed meaning there is a 60% probability of the integration activity starting on time. Therefore the probability of the three activities achieving ‘on time’ completion as opposed to ‘late’ completion should be 0.9 x 0.9 x 0.8 = 0.648 or a 64.8% probability of the integration activity starting on time. Which of these probabilities are correct? The more usual project scheduling situation where activities 1, 2 and 3 are joined ‘Finish-to-Start’ in series (an interdependent series). Is there any way of determining the probability of activity 4 starting on time from the information provided or are range estimates needed to deal with the probability of the activities finishing early as well as late? Don’t procrastinate about your goals for 2013! The strategies for achieving goals were purported to have been defined in the “1953 Yale Study of Goals.” But, as it turns out this study is little more than an often-quoted urban legend that, it appears, was never actually conducted. So based on real scientific study if you want to fulfil your New Year Resolutions and achieve your goals for 2013 the verdict is in – write down your goals, ensure they are SMART (Specific, Measurable, Actionable, Realistic and Time-framed) and tell your friends or colleagues. The research shows that that people who write down specific goals for their future are far more likely to be successful than those who have either unwritten goals or no specific goals at all; and that people who wrote down their goals supported by ‘action commitments’, shared this information with a friend, and sent weekly updates to that friend were on average 33% more successful in accomplishing their stated goals than those who merely formulated goals. Unfortunately, the research did not identify a way to prevent us procrastinating about getting started and actually writing some formulated goals down …… but there are some useful ideas in our White Paper on ‘Personal Time Management’ that can help. 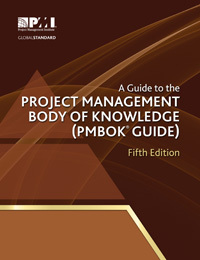 The publication of the PMBOK® Guide 5th Edition is a major boost for stakeholder management. The introduction of Chapter 13, Project Stakeholder Management as a distinct knowledge area raises the importance of engaging stakeholders to the same level as all other PM ‘knowledge areas’. Ideally the new section would have been placed next to the closely aligned process of communication management but this is not to be – the PMBOK is expanded by adding new chapters to the end. 13.1 Identify Stakeholders – identifying everyone affected by the work or its outcomes. 13.2 Plan Stakeholder Management – deciding how you will engage with the stakeholders. 13.4 Control Stakeholder Engagement – monitoring the overall relationships and adjusting your strategies and plans as needed. Identify – the primary purpose of 13.1 with very similar objectives. Prioritize – This is mentioned in 13.1 (Identification) without any real assistance on an effective approach to this important task. The PMBOK recognises most projects are going to be resource constrained and should focus its engagement activities on the important stakeholders but that’s all – options to calculate a meaningful prioritisation is missing. See more on prioritisation. Visualize – This is also included in 13.1 (Identification) based on a simple 2 x 2 matrix. A number of options are listed including power/interest, power/influence, and the influence/impact grids. The Salience model developed by Mitchell, Agle, and Wood 1997 is also mentioned without attribution. In reality to properly understand your stakeholders you need to understand significantly more than two simple aspects of a relationship. The ‘Stakeholder Circle’ diagram was adapted from the Salience model to help teams really appreciate who matters and why. This will be the subject of another post in a couple of day’s time. Engage – the primary purpose of 13.2 (Plan engagement) and 13.3 (Implementing the communication plan). Separating planning and implementation is a good idea. The planning process uses an engagement matrix similar to the tool built into the ‘Stakeholder Circle’ – However, whilst the PMBOK looks at the attitude of each stakeholder (both current and desired) it omits the key consideration of how receptive the stakeholder is likely to be to project communication. If the stakeholder does not want to communicate with you the challenge of changing his/her attitude is a whole lot harder and the missing priority level lets you know how important this is. Monitor and Review – whilst this is the focus of 13.4, the assumption of review and adjustment is a statusing process. Our experience suggests the dynamic nature of a stakeholder community requires the whole cycle starting with the identification of new and changed stakeholders to be repeated at regular intervals of 3 or 6 months (or at major phase changes). As mentioned at the beginning, the introduction of a separate knowledge area for stakeholder management is a huge advance and should contribute to improving the successful delivery of projects – PMI are to be congratulated on taking this step! However, unlike most other areas of the PMBOK, the processes outlined in this 5th Edition are likely to be less than adequate for major projects. As soon as there are more than 20 or 30 stakeholders to assess and manage, the tools described in this version will be shown to be inadequate and more sophisticated methodologies will be needed.